In the past few months, Enamel lapel pins have suddenly become sort of fashion statement. Not only have they entered the world of fashion designers and fashion conscious youngsters, but they have also changed the lives of many entrepreneurs. You would already have noticed that many designers have started incorporating enamel lapel pins in their designs, especially on materials like denim, leather jackets and backpacks. This is mainly because these simple pins can successfully add some sense of personality to your fashion. They look cool. However, enamel lapel pins are not always cheaply available if you want to purchase them from the market. There are only a few places like vivipins where you can get the lapel pins for a good price while still maintaining the quality. Hence, it makes sense to make your own enamel lapel pins at home if you can. Plus, making your own pin gives you the freedom to express your own creativity any way you want. After doing a bit of research, we have been able to bring to you a step by step guide to make your own enamel pins at home. To begin with we will need to take our sand paper and use it to roughen the shrink film just a little bit. The next step is to wipe off any dust from the Shrink film. We are roughening up the shrink film in order to allow the paint to stick to the plastic. Otherwise, it will spread out or not stick at all. Don’t go overboard in using the sand paper though. The next step is to design your own Enamel Lapel Pin. You need to draw the design that you will be using on your Enamel Lapel Pin. If you are good at drawing, you can sketch the design yourself. Otherwise, you can use any SketchBook tool available in the market and print it out. Once you have your design ready, place the shrink film on top of the image and use a permanent marker to draw the outline of the shape. Try to draw a thickish outline as the outline makes the Enamel Lapel Pin shine out. Once the outline of the drawing has been completed, it is time to paint the design. Use the Enamel paint to fill in the desired color. Make sure the design looks exactly how you wanted it to look. Make sure that you are using a thin layer of the paint. Do not worry if the paint goes on the black outline. The black outline can always be redrawn once the paint has dried up. Once the design has been completed and the paint is dry, it is now time to cut the design out of the plastic. Make sure that you do not mistakenly cut out the black outline. You can always give finishing touches afterwards if any white space is left on the outside. Ensure that the finishing of the design is smooth and the black outline isn’t touched while cutting. Otherwise, it may completely spoil your design. Now that we are ready with the design, we will shrink it. Put your design on a baking sheet and place it Inside the oven. Run the oven at 250 degree Fahrenheit for approximately 5 minutes. This should be enough time for the shape to shrink completely. It will be very hot. So, don’t go removing the design from the oven immediately. Let the design cool down for some time. Once the design has cooled down, you can add one clear topcoat to give the design that Shiny glossy finish. This is a very simple process. You need to dip your brush in the gloss decoupage and then paint over the design with it. Be sure to cover all the areas in the design. We don’t have a small patch of enamel looking less shiny than the remaining parts. Once the top coat of gloss has dried up, we now need to attach the design over the lapel pin. 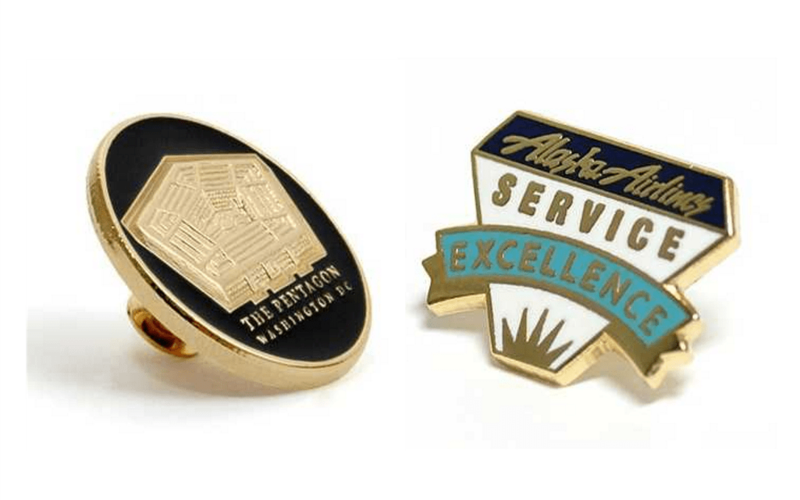 Once you have attached the design to the lapel pin, you are done. Your enamel Lapel pin is now ready to use as a fashion accessory. I hope you successfully made the Enamel lapel pin with our guide. If not, you can get custom made lapel pins from vivipins. Enamel lapel pins will help you give out a style statement that a normal design won’t. It adds a unique bit of personality to you. WIth the tips given above, you can make your own Enamel Lapel Pins. Enjoy your new accessory. How did you find our step by step guide? Did you mess something up? Or was it perfect? Share your comments and/or ideas below.